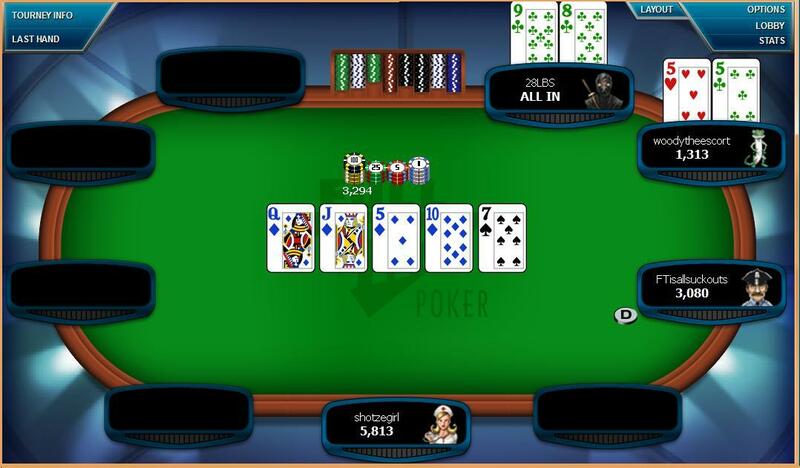 FullTilt Poker was launched by parent company TiltWare, LLC in June 2004. Founding members include well known poker players Chris Ferguson (PhD in computer science UCLA ), Howard Lederer, and Phil Ivey was also in on the deal. Full Tilt rose to the top of the online poker room scene second only to PokerStars, following the departure of several big name sites due to USA poker legislation - Unlawful Internet Gambling Enforcement Act (UIGEA). the money owed to players was returned and Full Tilt was back in business under a new owner. 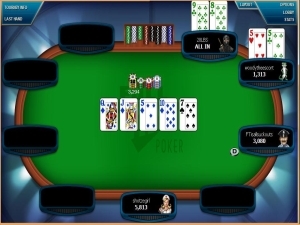 With the USA prosecution problems behind it, and managed by a well funded company, Full Tilt is back offering the same great online poker experience that made it popular. 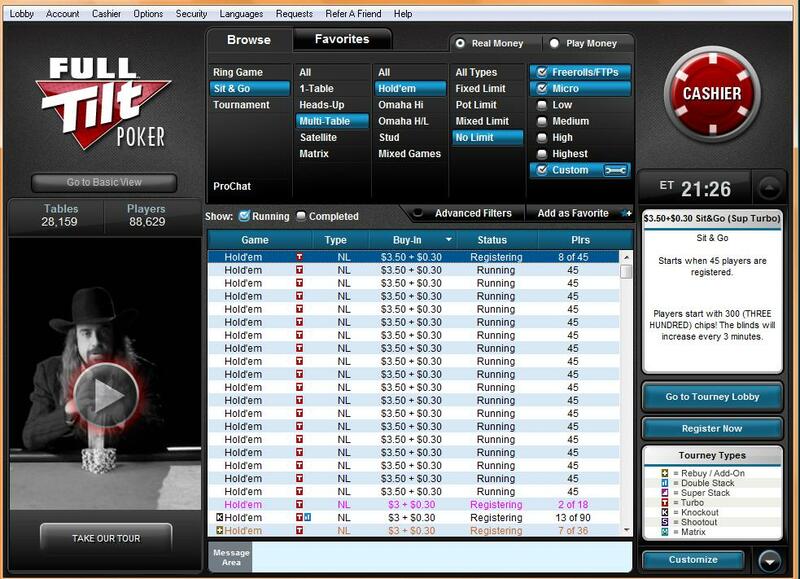 One of the most exciting and innovative features of online poker (Rush Poker) was invented by FullTilt. All the big sites soon cloned and implemented it for themselves. This is the FullTilt default Poker table. It is THE best poker table to play on. The colors are soft no glare from the table or cards. the cards and clear large text 4 color option. It is an excellent interface to play on. Play for hours and have fun! 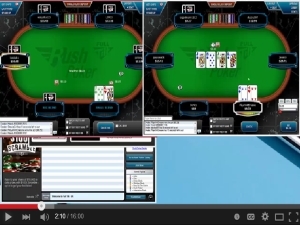 Here is a 5c / 10c no limit Rush Poker video on Full Tilt with a special "Gold Rush" promotion where any player who is in the hand gets a chance to win big prizes. 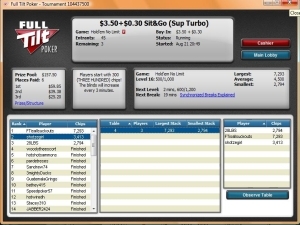 It is one of many special deals freerolls and tournaments sponsored by Full Tilt. The player traffic on FullTilt is not as the glory days before Black Friday, as most player on the site were from the UsA but it is still a popular destination for jurisdictions where online poker is allowed. Here is Evan again from Gripset.com duking it out on a Full Tilt $50 Jackpot Rush Poker Sit-n-Go table. 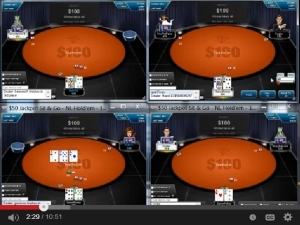 Sit-n-Go's are popular on Full Tilt. They fill up within a few minutes then you can sit back and enjoy a good long session at whatever buyin you selected. $1, $5 $10 all fill up fast giving u good entertainment value for your buyin and win a good chunk if you last into the money.